Adoption of digital finance could add $3.7 trillion to the GDP of emerging markets economies, including $1.1 trillion in China alone, according to a new McKinsey & Company report. The strategy consulting firm’s Global Institute released Digital Finance For All: Powering Inclusive Growth in Emerging Economies, at a New York event featuring a keynote by Gates Foundation co-chair Melinda Gates. Compared to advanced economies, many of these areas can be data desserts when it comes to statistics on particular consumer behavior or business sectors. In Africa, for example, several recent GDP revisions revealed outdated statistical methods were missing billions of dollars in economic activity. Most of the blame for the missing numbers falls squarely at the feet of the cash-based economies that comprise the majority of financial activity in these markets. Roughly 90% of transactions in high growth markets are done with cash. Cash does not leave the “rich datasets created by digital payments,” which can expose statistical blind spots and spur greater lending by creating more complete credit reporting. 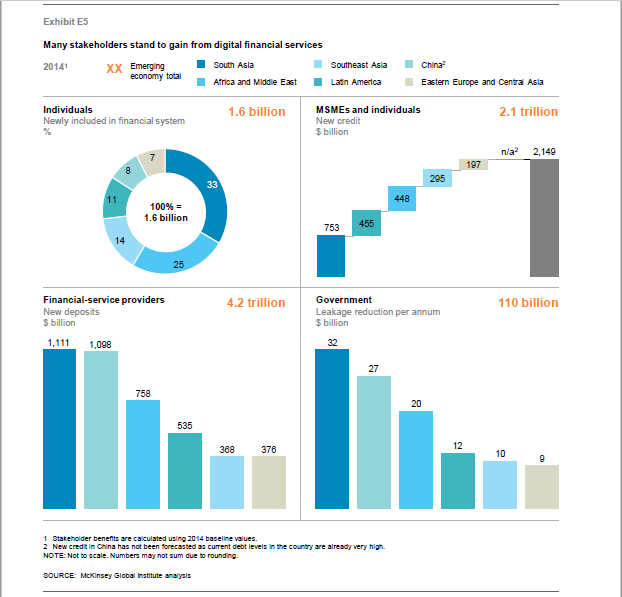 McKinsey’s survey then offers compelling projections on the potential of digital finance—defined as “financial services delivered over digital infrastructure…with low use of cash…”—to transform emerging market economies. An estimated 880 million women in emerging economies could gain first time financial account access through adoption of mobile and digital finance, according to McKinsey. Fintech services could open up $2.1 trillion in credit to individuals and MSMEs. McKinsey’s report offers several country case studies where it estimates the “GDP boost” potential of digital finance to each economy: China ($1.1 trillion), India ($700 billion), Brazil ($152 billion), Mexico ($90 billion), Nigeria ($88 billion) and Ethiopia ($15 billion). While the emerging markets digital finance report does not offer investment advice, McKinsey’s Lund thinks U.S. tech actors will take note of the findings and offered some advice. “This is a profitable business opportunity and the door is wide open. But local partnerships will be important in navigating these markets strategically,” she said.